Philippe Fénelon's "création mondiale" of Faust in Toulouse revolves apparently around a large carved skull large carved pumpkin. The Capitole opera house in Southern France seems to appreciate the subtle dig at hellish US tradition and the nice "Peanuts" hommage. 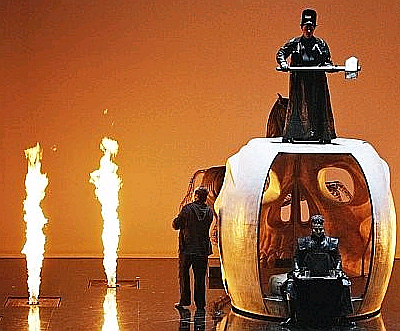 Dutch Tenor Arnold Bezuyen and US baritone Robert Bork play Faust and Mephistopheles, German conductor Bernhard Kontarsky tries to make sense of the orangey mess.